A new cockpit display system using tactile information was proposed. 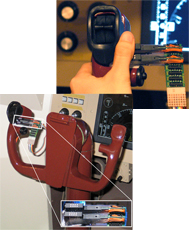 A 6×4 pin-array-type tactile display device was mounted on an aircraft control stick, and provides a pilot with altitude tracking cue. Results of preliminary pilot-in-the-loop simulation demonstrated that this system could support a pilot in maintaining an assigned altitude with only partial reference to altitude and/or vertical speed instrument indications.